"This car has such and incredible design. My favorite car I ever owned." The car and a signed copy of this very photo could be yours. 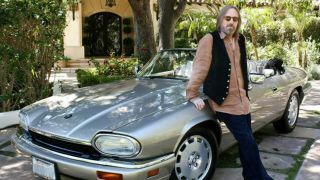 Tom Petty won't be comin' around here no more... not in his treasured Jaguar convertible, that is. The Rock And Roll Hall Of Famer is auctioning of his personal 1996 Jaguar XJS Convertible - said to be something of a modern classic, as production on the model ended in 1996 - and it's all for a great cause, as proceeds go to Doctors Without Borders. "I have so many great memories associated with this car," Petty says of the sweet ride. "When I began dating Dana [his wife], I asked her what her favorite car was. So I phoned the office and said I wanted a Champagne convertible Jaguar XJS. The next day they delivered it to my house and showed me how everything worked, and I took it for a drive down the Pacific Coast Highway. I was in heaven, as was Dana. This car has such and incredible design. My favorite car I ever owned. We sure are going to miss it." If you have the bucks, you can romance your own sweetheart in the Jag by heading over to eBay. The auction starts at 2pm PST on 11 October. Click here for more information.